Here is our proposal SURF & YOGA & SPA for those who want to enrich their surf experience in Itacare', with total relaxation through therapeutic massages and yoga sessions. Surfing, yoga and wellness package in Itacare ', in the Bahia region of Brazil, with: accommodation in our surf lodge or surf house, progressive surfing course for all levels with 4 hours of surfing practice, 1 hour per day of theoretical lesson and video analisis and a surfing instructor every maximum 5 students, 3 therapeutic massages of 1 hour each and 2 yoga lessons of 1 hour each. We have surf equipment in great condition and all sizes, so you can try different surf board shapes depending on the waves and your progress. 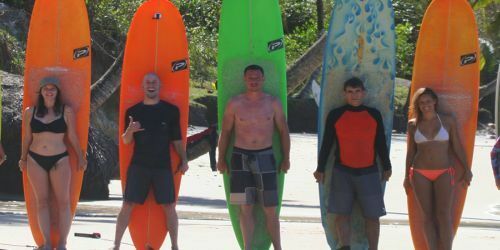 All of our instructors are part of the Brazilian surfing federation and our masseuse is qualified and very experienced! IMPORTANT: Rates for Christmas, New Year, Carnival or any other Brazilian party on request ONLY. All rates may change according to the exchange rate Euro / USD. Itacare', in Brazil is easily reachable by international flights with final destination Ilheus airport (IOS), about 1,5 hours from the camp by car. Flights to Ilheus often fly via Sao Paulo airport (GRU). Surfcamp / airport shuttle: Included in the package price you will have airport / camp return transfer, with our private driver. Most nationalities do NOT need a special visa to go to Brazil (90 days on arrival). It is advisable to make several copies of your passport, if the original gets lost. There are good hospital facilities in Bazil, but we recommend traveling with an international travel insurance.